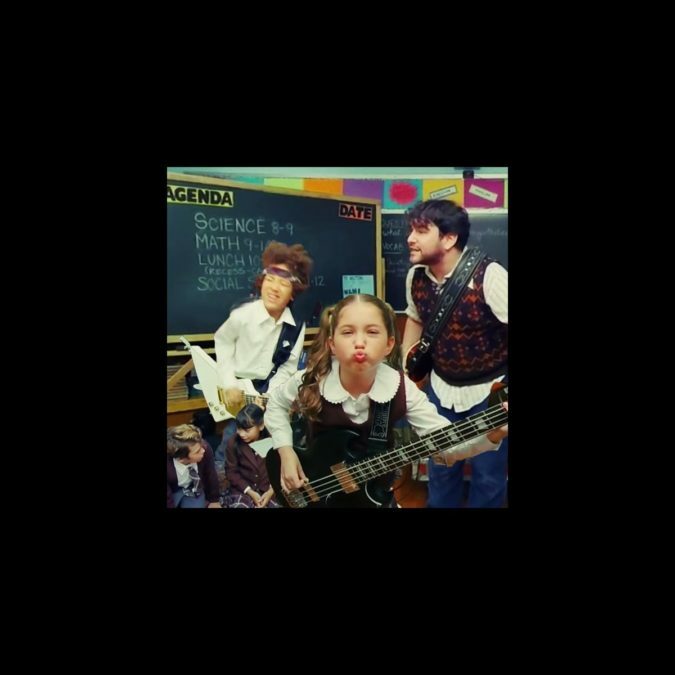 School of Rock Goes 360 in New Video; Check Out Our Favorite Moments! No matter which way you turn, you can’t stop the School of Rock! In anticipation of the new musical’s Broadway takeover at the Winter Garden Theatre, composer (that's an understatement) Andrew Lloyd Webber just released an interactive, 360-degree music video of the head-banging number “You’re In the Band,” written by him and lyricist Glenn Slater. Take a look (either on your desktop in Chrome—or better yet—the YouTube mobile app; it's fun!) as Alex Brightman and a host of talented tots rock out on location in every corner of a New York City classroom. We’ve scoured the clip at all angles; here are just a few key moments to look out for. Rock on! Not only are these kids good at shredding, they're not too bad at catching either. Who needs a backpack? Screw backpacks! The classroom is replete with hidden gems for theater geeks, including some chalkboard art of familiar Andrew Lloyd Webber tuners. Can you spot his picture on the wall? Everything's more dramatic with a fog machine. That's why whenever we break news, we do so in a cloud of smoke. Want to sing and play along? Just navigate up to the ceiling for the chords and lyrics! Wait, why didn't our elementary school classrooms have flashing pink lights? Look at those kids go! Desktop Users: For best experience, open “You’re in the Band” in your Chrome web browser to access the full 360° experience. Once playback begins, use the on-screen arrow keys or “click and drag” inside the frame to move around the classroom! Mobile Users: Open “You’re in the Band” in your YouTube App on your iOS or Android device (version 8+). Once playback begins, turn your mobile device in any direction or use your finger to move around the classroom! Catch School of Rock on Broadway beginning November 9!